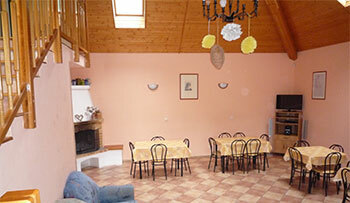 The Ružín holiday boarding house is situated in the East Slovakian region, 23 kilometers from Košice. 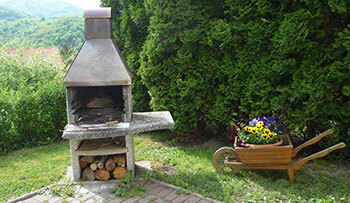 If you want to spend some pleasant moments with your friends and relatives near Košice, you are at the right place. The family house-like holiday boarding house is a perfect place for spending holiday and organising courses. Boarding house has 6 bedrooms, spacious lounge and kitchen. Equipment: fireplace, TV, satelite receiver, hifi, fully equipped kitchen with refrigerator, freezer, stove, microwave oven, coffee machine, pots and plates. more.. Apartment has 2 bedrooms and 1 living room, although it is suitable for 3 persons to sleep there. 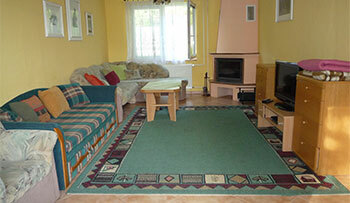 It is equipped with: fireplace, TV with satellite receiver. Fully equipped kitchen with dining room. One bathroom (with a shower corner) and a toilet. more..
Closed area with parking for 8 cars, with relaxation areas, fireplace, garden grill, gazebo, garden furniture, swings and parasols. The building is divided into boarding house and aparment – with separate entrance. They can be booked separately.